You are currently browsing the archives for the Menswear category. Q1 – Can I just expect to be able to just return a gift?A purchase is like a contract you have made with a store. You decided to buy it at the price they offered. The contract is completed and you are both satisfied. No returns are considered. If they choose to change the terms, it is solely up to each business and not a consumer law. Don’t assume when you buy something you can just return it. Q2- So they don’t have to take it back? Q3 – How can the customer know this? Are there any rules that a store must follow for returns policies? – Ask at the store what the policy is. Often after Christmas, there’s more leniency and some stores even have a stamp which can allow you to return months later if you are an early shopper. Q4 – What if it’s broken? A defective product has to be returned to the manufacturer and it depends on the retailer’s policy and it is up to you to find out if you or they have to do this. Q5 – Any other important suggestions? Your struggle to find perfectly-fitting clothes ends now. If you’re a big guy no matter what your size or shape, this family-owned store has been specializing in men’s big and tall clothing for 90+years and they know how to wow their customers with an incredible selection. Add comfort to your look and stay warm this winter; everything is here for you from activewear to formalwear to stylish everyday casual fashions and snazzy accessories to complete and complement your wardrobe. 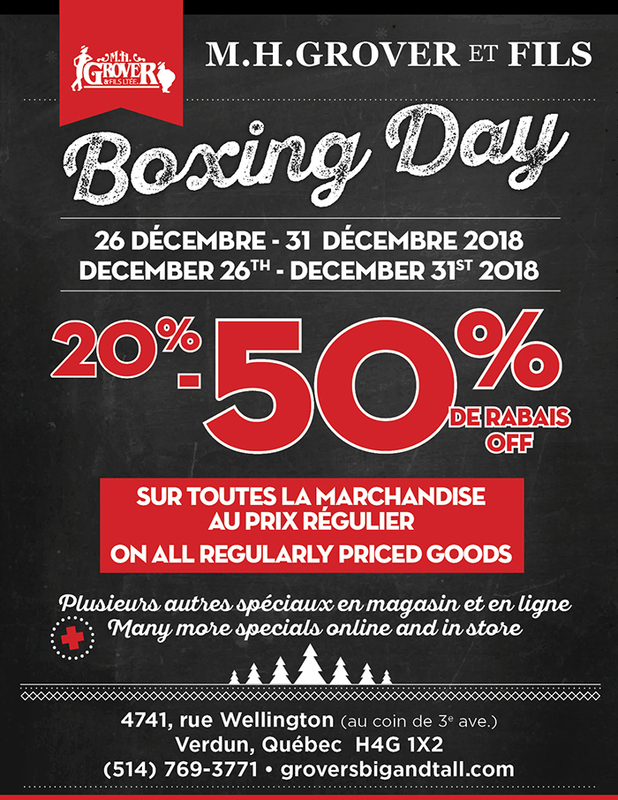 Right now save 20% – 50% off on all regularly priced items at the much anticipated Boxing day Sale. Get to M.H. 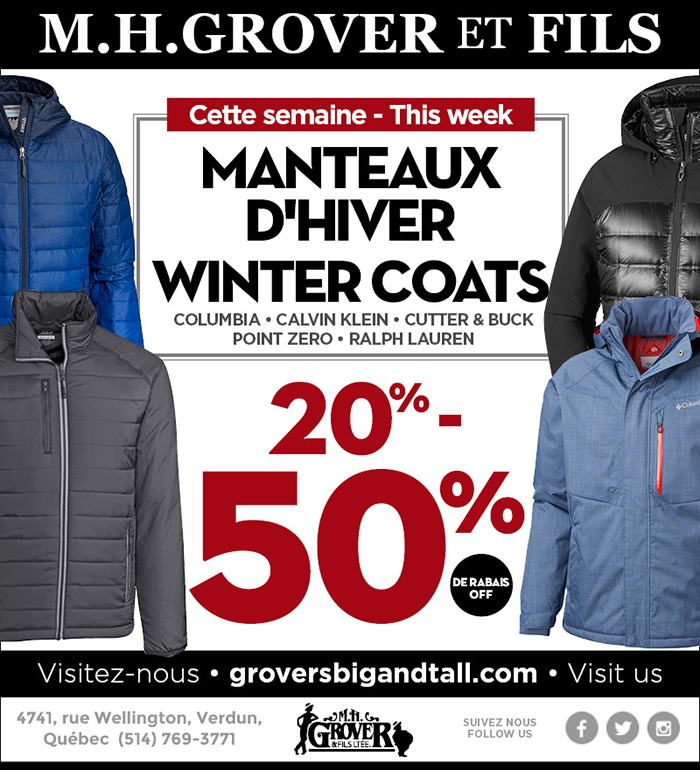 Grover, the go-to store for the latest in Men’s big and tall fashions and always finding the perfect fit. Now’s the time to save BIG on the brands you love by taking advantage of their Boxing day discounts. Gearing up for the colder months requires a coat that can withstand the elements, and fit well too. M.H. Grover has always been the place to go for the latest in big and tall styles. Keep the cold out and turn up the style by saving 20% – 50% on winter coats, in brands: Columbia, Calvin Klein, Cutter & Buck, Point Zero and Ralph Lauren. This family-owned store has been specializing in men’s big and tall clothing for 90+years and they know how to wow their customers with a wide selection of your favorite premium labels all under one roof. Everything is here for you from activewear to formalwear to stylish everyday casual fashions and snazzy accessories to complete and complement your wardrobe. If you’re a big guy, or need a gift for one, this is the place to go for the latest in big and tall styles. It is one stop shopping for the hard-to-fit guy. 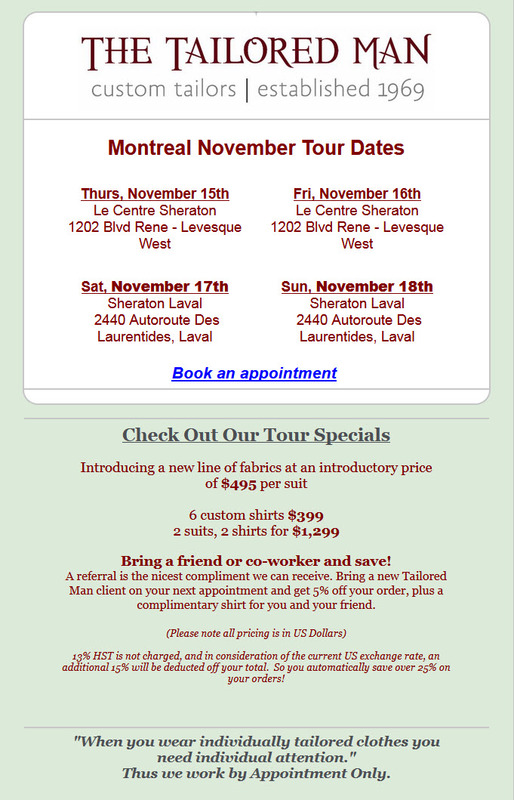 Sunder Daswani and his team are back in Montreal for their November Tour. Since 1969, The Tailored Man has been coming to North America fitting men (and women too) with made-to-measure suits at Hong Kong’s prices. Now’s the time to take advantage of their special on shirts: six custom made dress shirts for only $399. The price includes freight, duty and of course, monogram. They will also be introducing a new line of fabrics at an introductory price of $495 per suit, or how about 2 suits, 2 shirts $1,299. All pricing is quoted in US Dollar, but you will not be charged 13% HST, and because of the current US exchange rate an extra 15% will be deducted from your order. You save over 25%. “When you wear individually tailored clothes you need individual attention”, so they work by appointment only. To make a personal appointment: 866-751-7868 or 647-989-0555 or tailoredman.com/appointment. When it comes to men’s clothing, Made in Italy is synonymous with quality, craftsmanship and design. 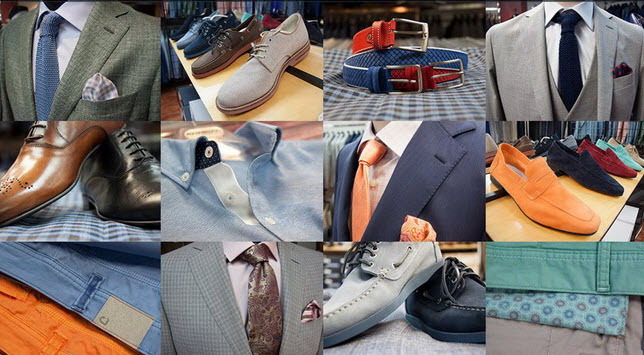 Les Importations J.E.A Polcaro Imports has been delivering high-end Italian menswear to the city of Montreal at wholesale prices for the last 30+ years. Quietly located in Peel’s Hermes building, a hidden treasure right in the heart of the city’s most well known shopping street, you can buy impeccable suits for discerning men of style to casual weekend wear, everything from the necktie down to the socks. This is the perfect time to add a touch of sleek style to your wardrobe and treat yourself to the latest in men’s Italian fashion collections from designers and luxury brands that need no introduction, Cerruti 1881, Verace, Valentino and Corneliani. J.E.A. Polcaro is importing and selling directly to you without the markup of a middle man, therefore offering you wholesale prices. A great way to get designer goods at deep discounts. Take advantage of 100% cotton, Made-in-Italy shirts at $79, Made-in-Italy suits at $550 and Made-in-Italy ties at $29. You will not find synthetics here, only silk, wool, linen, cashmere and cotton. Add a touch of swagger to your personal style by allowing the salespeople at Les Importations J.E.A. Polcaro to guide you in the art of putting all of it together to achieve some distinctly winning looks. Discover Montreal’s best kept secret. Robert Graham, Base London, Hudson, Parker, John Varvatos 50-75% off. Tomorrow and then for two more days, men and women can find amazing deals on designer apparel right downtown, at Throat Threads Sample Sale Event. Now you have a chance to purchase high-end, current season’s designer merchandise at a fraction of the price. You’ll find price tags slashed just enough for you to finally afford your favorite dud, men’s shoes, and accessories. Shop featured designer labels: Parker, NYDJ, John Varvatos, U.S.A., Base London, Robert Graham, Hudson and Brax with discounts of 50 – 75% off. Fall/Winter 2018 designer, stylish accessories and famous brand threads are at up to 75% off retail, so head on over. 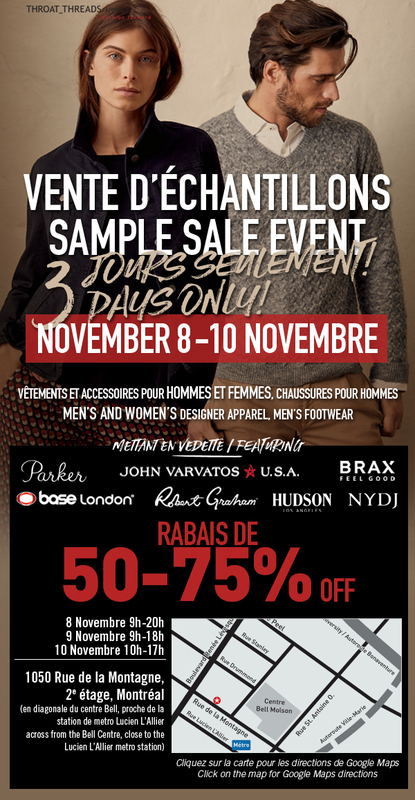 Posted in Clothing, Menswear, Sample Sale | Comments Off on Robert Graham, Base London, Hudson, Parker, John Varvatos 50-75% off. How many stores do you know that can boast 93 years in business? M.H. Grover is the real deal. This family-owned store knows how to offer great service and to wow their customers with a super-sized collection of Big And Tall styles and brands. There’s never a wrong time to spruce up your apparel, so to celebrate their anniversary they are offering you a sweet deal – 15% – 50% off everything in – store or online. 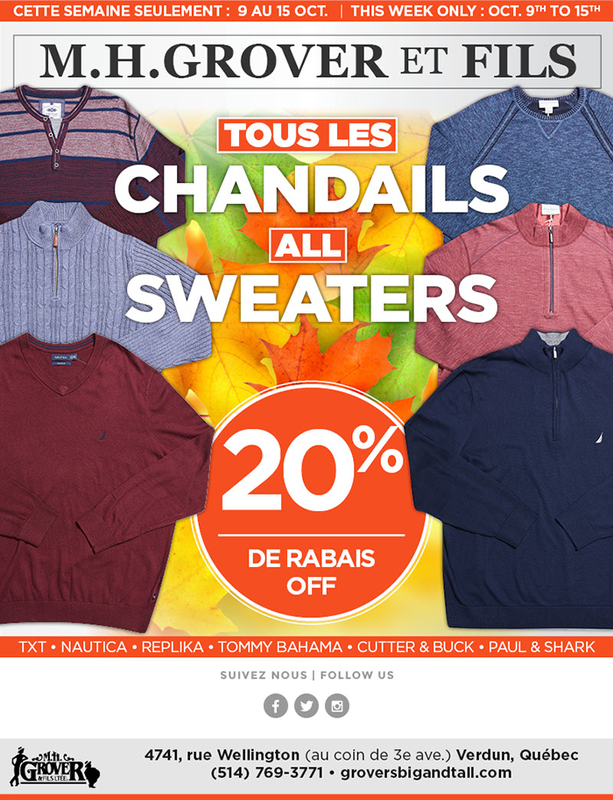 Shop the latest in men’s big & tall fashions with a stylish variety of your favorite premium labels all under one roof and on sale: Cutter & Buck, Nautica, Columbia, Tommy Bahama, TXT, Replika, Point Zero, Calvin Klein and Paul & Shark. Regardless of height, shape or particular clothing requirements, M.H. 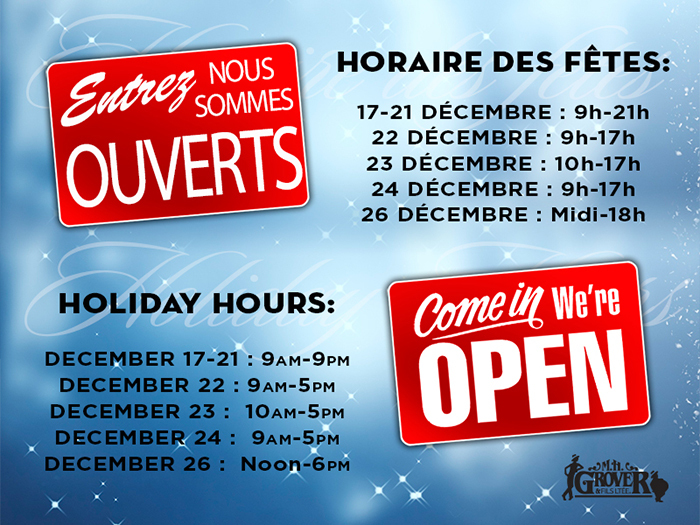 Grover will have you looking great in comfortable and stylish clothing with the best prices around. You will find everything here from activewear to formalwear to stylish everyday casual fashions and snazzy accessories to complete and complement your wardrobe. This is the destination to shop the latest in men’s bigand tall fashion. Men, as the air chills, it’s time to re-fresh with new Fall and Winter clothes. Right now you can shop smart at Jaf which is closing its clearance store in Laval. 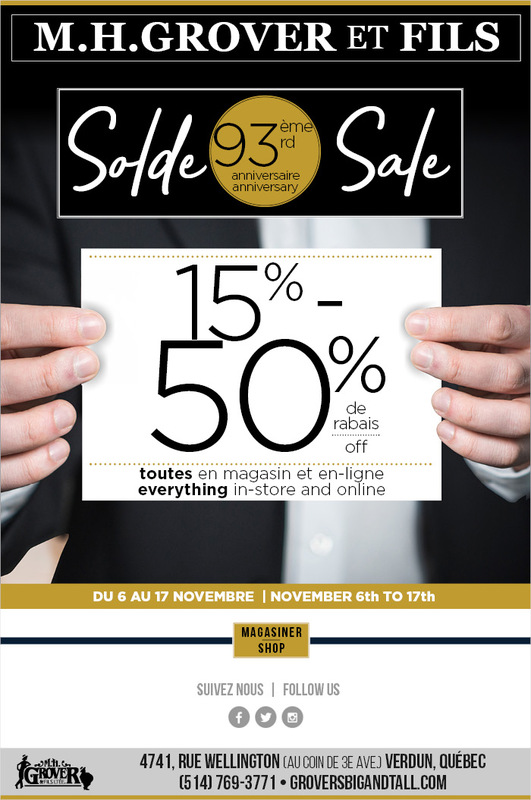 Everything must go – and all up to 80% discount. You might come across well-known brands – Michael Kors, Robert Graham, Jack Victor, Baumler, Fred Perry, S. Cohen, Jacques Britt, Tombolini, Tommy Bahamas, Victorinox, Ted Baker, m.e.n.s., & Alberto. This family owned business is the place to shop for men looking for affordable superior quality products. Whether you dress elegant, casual, stylish or classic, JAF Prêt-à-Porter is the destination that shouldn’t be missed. The cooler weather is finally here so men, including those big and tall guys, it’s time to start thinking of updating your Fall/Winter wardrobe. There’s never a wrong time to spruce up your apparel and at M.H. Grover they are kicking off the season with a 20% reduction on their name brand sweaters. Add comfort to your look and stay warm with stylish big and tall sweaters for men M.H. Grover has a variety of your favorite premium labels all under one roof and on sale: Cutter & Buck, Nautica, Tommy Bahama, TXT, Replika and Paul & Shark. If you’re a big guy no matter what your size or shape, this family-owned store has been specializing in men’s big and tall clothing for 90+years and they know how to wow their customers with a wide selection of new arrivals. Everything is here for you from activewear to formalwear to stylish everyday casual fashions and snazzy accessories to complete and complement your wardrobe. This has always been the place to go for the latest in big and tall styles.